The former capital of the Confederacy, Richmond is an attractively-sized, livable capital city with a strong sense of history. The downtown area mixes unremarkable modern buildings with some historic features. On the whole, the area has a considerable base of historic sites, museums and neighborhoods. Outlying suburbs have sprawled concentrically, especially to the west towards Tuckahoe and south towards Petersburg. Easy access to Washington, D.C 100 miles north and pleasant residential settings have attracted businesses. Future job growth is among the highest in the state. Retailers Circuit City and CarMax and financial services giant Capital One make their headquarters in Richmond. The area is spread out and there are some traffic problems, but growth seems to attend to aesthetic considerations and most suburbs are more attractive than in other comparable areas. The University of Richmond adds college-town amenities, including sports. 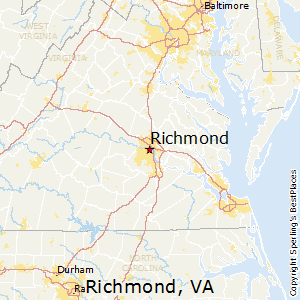 Richmond is located along the James River in a mostly wooded area at the border of the Coastal Plain and Piedmont Hills. The Blue Ridge Mountains lie about 90 miles west and the Chesapeake Bay is 60 miles east. Elevations range from a few feet above sea level along the river to over 300 feet in western sections of the city. The climate is modified continental. Summers are warm and humid, among the warmest in Virginia, and winters are generally mild. The mountains to the west act as a partial barrier to winter cold and storms. Precipitation is uniformly distributed through the year. Dry periods, especially in autumn, create periods of pleasant, mild weather. Snow usually remains on the ground only 1 to 2 days at a time and ice storms occur occasionally. Late summer and fall hurricanes along the coast can cause flooding. The median home price in Richmond is $214,800. Browse Homes in this Range. Compare Richmond, Virginia to any other place in the USA.